In the Western Premier league on Saturday, Stafforce Dumfries set a competitive total of 238 for 7 in their three wicket loss against league leaders Clydesdale at Nunholm. SIX: Josh hits another of his 10 sixes. An excellent 120 run partnership in just 13 overs between Josh Forsyth and Stuart Corbett-Byers brought Dumfries back from 117 for 5 with both batsmen out in the last over. Forsyth, the Greyfriars Medical Centre Dumfries Man of the Match, produced the innings of the day. He was caught for 95 off the third last ball, going for his century, having deposited a remarkable ten sixes over the boundary, and well beyond. Another 120plus run partnership for Clydesdale’s third wicket between Scotland players, opener Majid Haq, 86 not out, and Richie Berrington, with 83, set up the visitor’s win but not before Dumfries took five wickets in the closing overs as Clydesdale reached the finishing line with five balls left and seven wickets down. Scott Beveridge claimed four of the wickets. 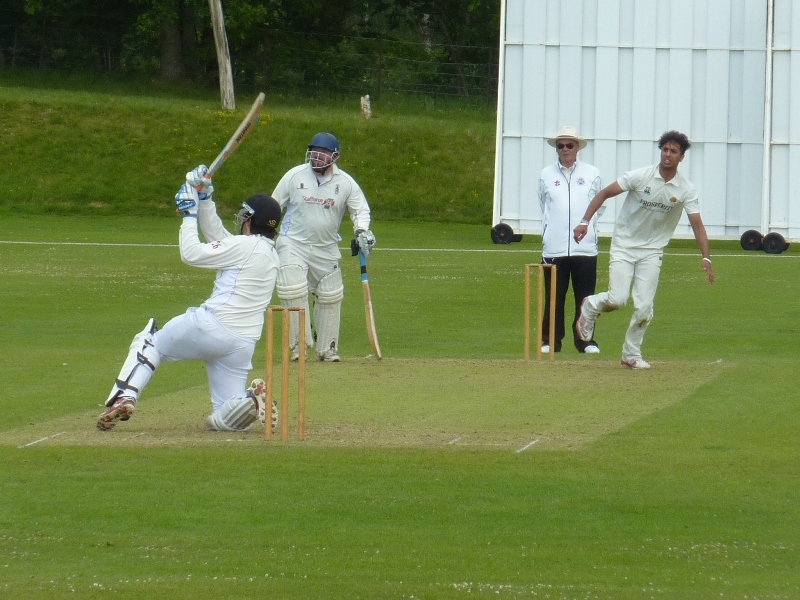 In the Western Premier Reserve league, Nunholm lost to Clydesdale 2nds, Titwood, by 87 runs. Titwood were six wickets down for just past the hundred but recovered to 210 all out. Davie Davidson took 6 wickets for 46 for the Dumfries side and was the Thomson & Jardine Dumfries Man of the Match. Then his was the top score, with 33, as Nunholm could only reach 123 all out in reply. This Saturday in the Western Premier, Stafforce Dumfries play away at Uddingston and Nunholm are at home against their seconds, Bothwell, in the Western Premier Reserve League.